The teeming hospital grounds in Bossangoa, a northwestern town in the Central African Republic (CAR), offer a glimpse into the worsening crisis the country has faced since a rebel alliance known as Seleka took power by force in March 2013. Over a thousand people are seeking shelter in the facility. Amid clouds of smoke from cooking fires, children sit listless, women pound maize and groups of men stare off into space. “We're here because of the Seleka, who came to our village, looted, ransacked and killed,” said Prophete Ngaibona, a father of eight with another on the way. "We are… I don't even know what to call us. We have nothing now. I can't even go to my house or fields. If they see me there, they'll kill me." Humanitarian and development indicators were dire before the coup, but now, amid increasing violence by armed groups and between communities and religious faiths, they are even worse: almost the entire population of 4.5 million has been affected; 1.1 million people outside the capital, Bangui, are estimated to be severely or moderately food-insecure; and there are almost 400,000 internally displaced people (IDPs), double the figure of just a few months ago. Around 65,000 people have fled the country, most to neighbouring Cameroon. “CAR was a failed state before. Now, it's just worse,” said Amy Martin, country head of the UN Office of Coordination for Humanitarian Affairs (OCHA). “We're estimating over 1.5 million people who need assistance of various kinds, whether it's health, nutrition, shelter, protection,” she said. But security concerns mean that aid agencies, whose vehicles have come under attack, can only guess at what's happening in some areas, and Martin said the actual number of people affected by the crisis could be much higher. “In most of the country, we're very worried about the level of violence we're seeing and that we're hearing about and [that we] get patients from in our hospital,” says Ellen Van der Velden, head of MSF Holland, which is operating in Bossangoa. The team has children under five recovering from bullet wounds. 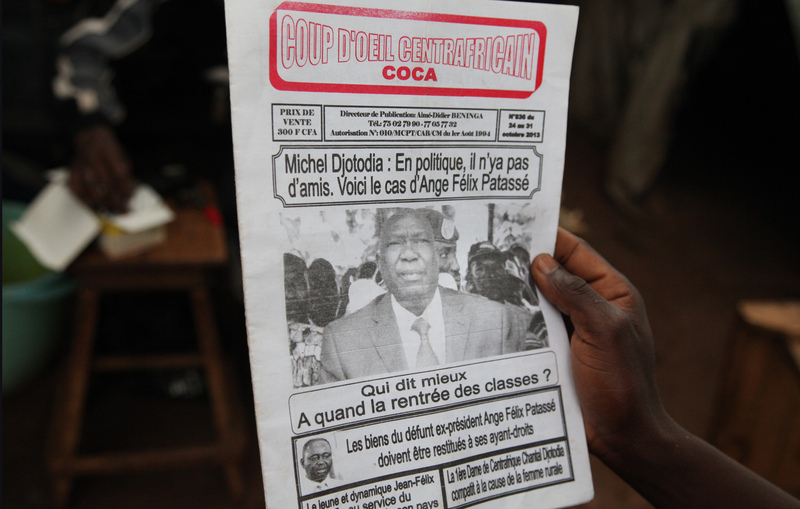 Over 36,000 people are seeking refuge at Bossangoa's Catholic Mission, after fleeing a coalition of rebels-turned-“government” forces that Michel Djotodia, a northern Muslim, enlisted to bring him to power in the March coup. Made up of large numbers of mercenaries from neighbouring Chad and Sudan as well as most of the country's former prison population, these forces are mainly Muslim, and have exacted a deadly revenge on mainly Christians in former President Francois Bozize's homeland. France has warned that CAR is “on the verge of genocide” because of the spiraling sectarian violence. Self-defence groups calling themselves “anti-balaka” - armed with machetes, bows and arrows and spears - have sprung up and committed atrocities not only on Seleka but also on the wider Muslim community. 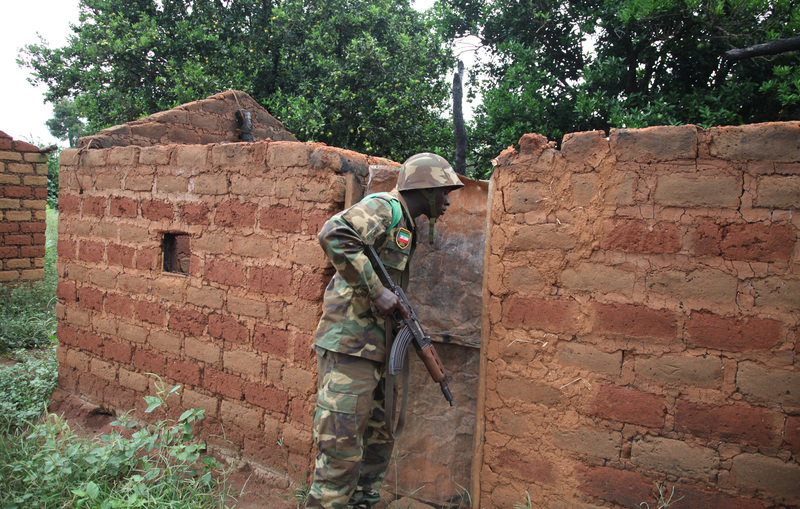 Such inter-faith conflict is a new phenomenon in CAR. As armed groups trawl the area, looting, killing and razing crops and homes, villages on the 100km stretch of road between Bossangoa and the capital Bangui lie empty. The only signs of life IRIN found were goats waiting patiently for their owners. Aside from the terror, people are suffering from illnesses as they hide in their fields with no shelter, medicine and food. Only the bravest or sickest take the highway to seek medical help at Bossangoa Hospital. “I'm absolutely worried that there are many cases out there that we can't reach. Not only violence, but the malaria,” said MSF doctor Florin Oudenaarden. In the 10 days she has worked at the hospital, the MSF team there has seen four children die, as many come in so weakened by anaemia, malaria and malnutrition that it is impossible to revive them. Van der Velden says that aside from the violence, malaria is the biggest killer, especially among children. At a recent outreach clinic, 120 out of 200 children tested positive for it. A two-year-old boy with severe malaria was recently rushed to the clinic by the outreach team, only to die on arrival. “If we had got there a day earlier, we could have saved him,” she says. Among the latest child victims at the hospital are a skeletal boy hooked up to a drip and covered in foil paper, who can barely blink for lack of strength. Another is a four-year-old boy who screams between doses of painkillers, his legs suspended from the ceiling; he was shot through the hips during a recent attack on a gold mine 25km from Bossangoa. MSF's surgeon doubts he will ever walk again; the bullet shattered his joint, requiring what would be a complicated and expensive procedure in the best of places. Due to insecurity and a lack of funding, UN agencies are only working in the towns, and the time and manpower of the International Committee of the Red Cross (ICRC) and MSF are limited compared to the scale of the crisis. “People are dying out there that can't access healthcare, and that's definitely a big concern,” says Van der Velden. “Our problem right now is that we cannot go beyond Bossangoa as we are underfunded,” says Pablo de Pascual, emergency coordinator for the UN Children's Fund (UNICEF), which has a $20 million deficit in funding for CAR. UNICEF has carried out a massive vaccination campaign for under-fives, and MSF is also joining the fight against diseases such as measles, which have flourished in CAR in recent months. “We are planning to address high levels of malnutrition in the coming months,” says de Pascual. As the rains end, the country will start its lean season without anyone to harvest crops. With violence raging across the country's traditional breadbasket in the north, Martin is also concerned about the lack of food, both for people there and in the rest of the country. Most market mechanisms throughout CAR have collapsed, and there is the blockade on trucks moving to the capital. Each day, around 40 people arrive at Bossangoa's Catholic Mission, a site spanning only 19 hectares, sparking fears about disease outbreaks. Humanitarian norms recommend 160 hectares for its current population. De Pascual says living conditions have been “deteriorating since the beginning due to a lack of access of basic public services and increasing numbers in the IDP sites,” sparking fears of cholera. Renate Sinke, MSF's project coordinator in Bossangoa, describes the living conditions as “horrendous” and thinks the scene is set for an epidemic. “My non-medical opinion is that I think it's a time bomb,” she says. The site has two open defecation fields, no hand-washing points and not a single shower. Still, diarrhoeal diseases are so far low. “We have now seven litres of water per person per day. Last week we had four litres - and it should be 15,” says MSF water and sanitation coordinator Rink de Lange. There are only 65 working latrines. “That means that, at this time, we have one latrine for 450 people, when the standard is one in 20. So that's a massive gap that has to be filled. And of course the location of the camp is so dense that it's hard to find places to build latrines,” he says. And people do not dare to leave for fear of encountering the ex-Seleka. Instability has pushed 70 percent of the nation's children out of education, and seen 3,500 recruited into rebel forces. “We still hear stories of people living only 500m away from this place and don't dare to go back into their houses,” says Sinke. Instability has pushed 70 percent of the nation's children out of education, and seen 3,500 recruited into rebel forces, and an unknown number recruited into the anti-balaka. “There are no children coming to school because of their brutality. How can they come to school? Kids can't, parents can't. We just have to stay like this,” says teacher Laurent Namneonde, who is now taking shelter in the mission's school, where he taught for 10 years. Lucien Rekoi is luckier than most in Bossangoa, who fled only with the shirts on their backs. With a heavily pregnant wife, he made it to the mission with pots, pans, clothes and his identity cards. His daughter was born six days ago. He now scours the site looking for international aid workers who will lend her a western name, in the vain hope that this and his deceased father's career in the French military might afford them a passport out of CAR. “I just want to go there [to France]. There's nothing for this place now,” he says.